This monograph deals with the kinetics of adsorption and desorption of molecules physisorbed on solid surfaces. Although frequent and detailed reference is made to experiment, it is mainly concerned with the theory of the subject. In this, we have attempted to present a unified picture based on the master equation approach. Physisorption kinetics is by no means a closed and mature subject; rather, in writing this monograph we intended to survey a field very much in flux, to assess its achievements so far, and to give a reasonable basis from which further developments can take off. For this reason we have included many papers in the bibliography that are not referred to in the text but are of relevance to physisorption. 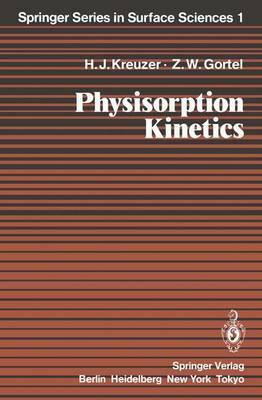 To keep this monograph to a reasonable size, and also to allow for some unity in the presentation of the material, we had to omit a number of topics related to physisorption kinetics. We have not covered to any extent the equilibrium properties of physisorbed layers such as structures, phase tr- sitions and thermodynamic properties in general. A number of excellent revIew articles, listed in the bibliography, cover this material. Likewise, little is said about scattering off solid surfaces; this subject is again covered in several books and many review articles. Lastly, little is said about chemisorption kinetics, for which microscopic thebries and models have not been fully developed but are still at a rather early exploratory stage.